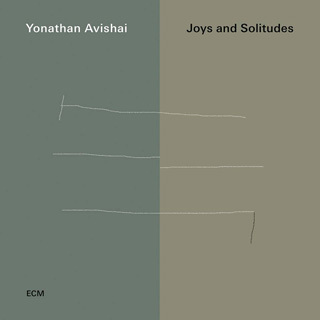 Although Yonathan Avishai has twice before appeared on ECM as a sideman, in quartets led by the trumpeter Avishai Cohen (most recently Cross My Palm with Silver, 2017), this is the first recording for the label under his own name. He’s a reflective and resourceful pianist, with a light touch and a finely nuanced sense of rhythm. His fellow musicians on Joys and Solitudes are Yoni Zelnik (double bass) and Donald Kontomanou (drums). Since 2015 they’ve issued a couple of recording under the group name Modern Times, but Joys and Solitudes, for all its strong interplay, seems designed as a showcase for Avishai. Although Zelnik and Kontomanou play well throughout, their solo contributions tend to be brief and less brightly spotlit. They enter and exit the music stealthily, almost imperceptibly at times, providing just the right amount of support when needed. Not that he’d need to. His own compositions are far from lacking. The stepwise single note introduction to Song for Anny has a distinctly Monkish flavour that, when further embellished, introduces hints of the baroque. Avishai slips in blues phrases here and there without dragging the music too far towards the Delta, and his Tango neatly bridges the gap between a more formal interpretation of that classic form and the alcohol-sweated tension of the dancehall. There are further intimations of the blues in the moody and complex When Things Fall Apart, and the bouncy rhythm and joyful lilt of Lya draw inspiration from the jazz that originated in the South African townships.